Near the beginning of Ma nuit chez Maud (1969, dir. 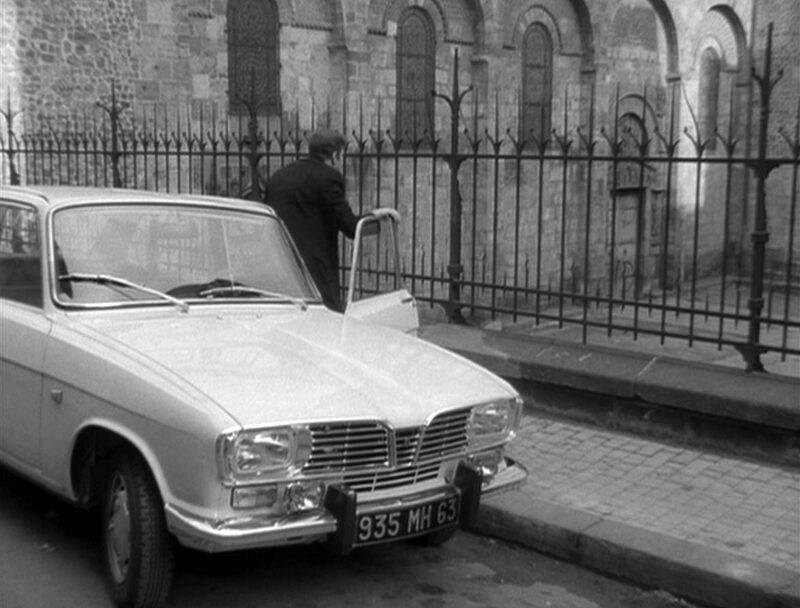 Eric Rohmer) our hero Jean-Louis (Jean-Louis Trintignant) drives into the city of Clermont. On the way we are shown images out the car window. At one point we see the spires of the church, known as the Cathédrale Notre-Dame-de-l’Assomption de Clermont-Ferrand, a.k.a. 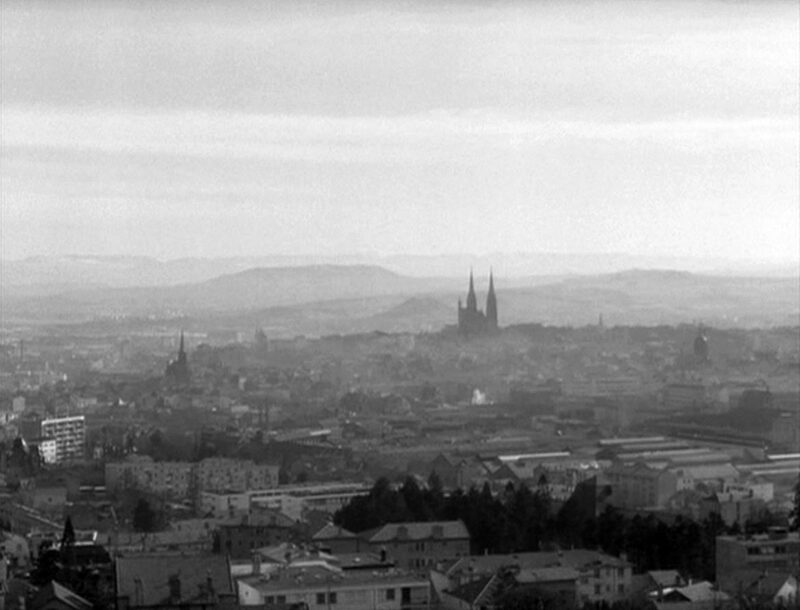 Clermont-Ferrand Cathedral, a.k.a. the black cathedral because it is made of black volcanic stone. 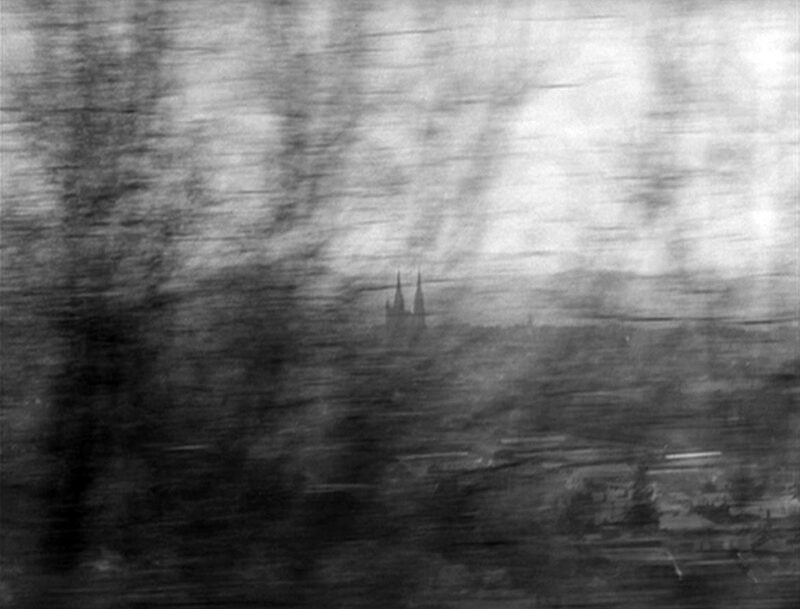 At first we see the cathedral spires (96.2 meters tall) partially hidden behind the trees which line the road into the city. Then suddenly we see the church revealed in the winter sunlight, standing powerfully above the city. We now also see the spire of Notre-Dame du Port, the other famous church in Clermont. From this image we cut to Jean-Louis getting out of his car. The sound of church bells pealing occur with the edit, almost as though the edit is signaled by the sound of the bells, further drawing a connection between the previous image of the church and Jean-Louis. Jean-Louis walks away from the car. The camera pans to follow him. Jean-Louis walks out of the frame and the camera tilts up to reveal a portion of the Notre-Dame du Port roof line. The connection is clear from a narrative point of view. The church, and more specifically, The Catholic Church (of course post Vatican II, but also in terms of its philosophical heritage), will dominate this story in some significant way. The next scene has our hero attending mass, drawing us even further into a religious context. This idea of a distant and looming “something” over one’s life is a powerful concept. It may be true that each of us has something bigger than ourselves looming over us with which we judge ourselves and judge others. If it is not the church, or our families, or our culture, then it is probably the weight of our own existence. There really is no escape. Where is it that we get our convictions? That is a far more complicated question than it might appear. For Jean-Louis the answer includes his Catholicism. 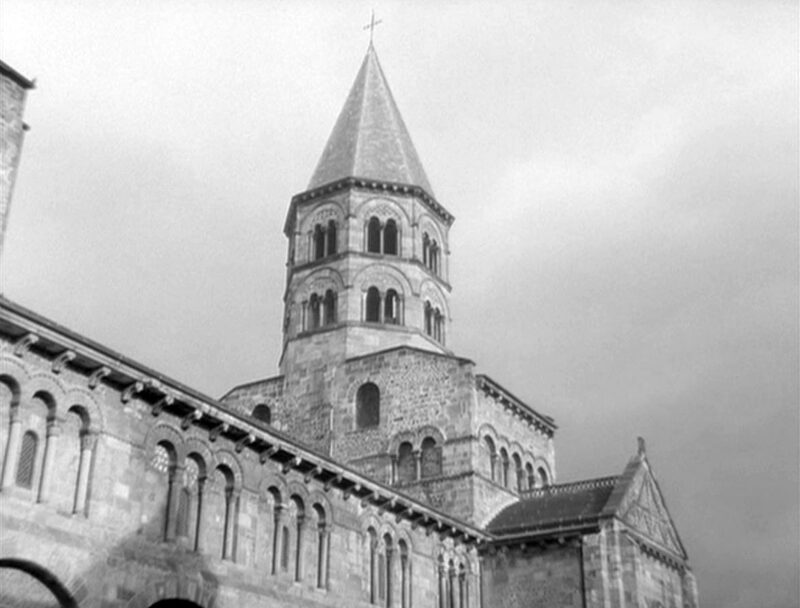 Rohmer placed his story’s time and place at Christmas in Clermont. Christmas raises the issue of Christianity quite large, and it gives Jean-Louis an excuse to go to mass, which is important to the story. We don’t know how regularly he goes to mass, but he does at least on Christmas eve. Clermont is also the birthplace of Blaise Pascal, the Christian philosopher who looms so large (like a cathedral spire) in the story. Pascal’s wager is a critical theme in the film. I also find it interesting that Clermont was the city profiled by Ophüls in Le Chagrin et la pitié (1969). WWII was not all that distant from 1969 France. Huge moral questions of complicity with the Nazi’s during those horrendous times still plagued many individuals in France even 25 years later. What one does with one’s moral past is an interesting dilemma. 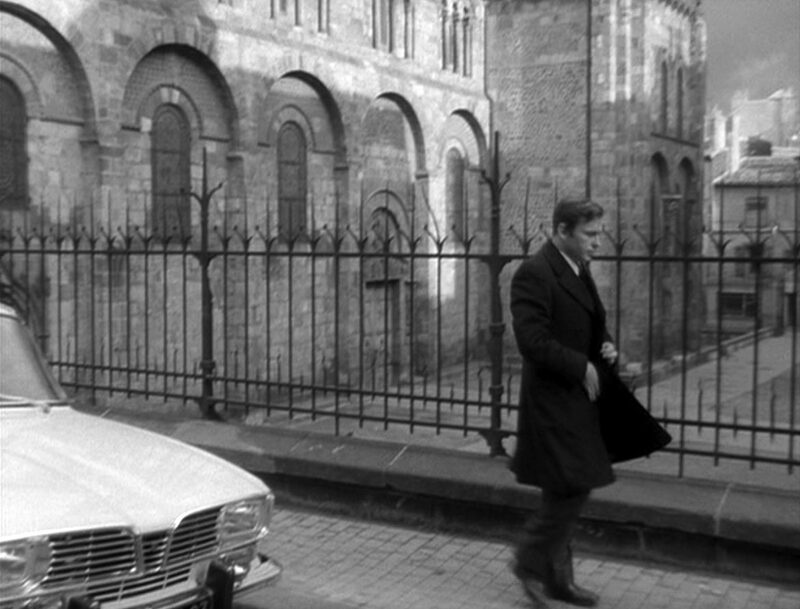 Later in the film Jean-Louis drives again into town and we see the cathedral spires in the distance. This moment comes after he has spent the night at Maud’s. It is almost as if the spires were calling to Jean-Louis to stay true to his convictions. Or, maybe they are gently taunting his frailty. In either case, they stand above him and beyond him in the distance. There is something interesting in the contrast between the immobility of the church, and all that it represents, and the mobility of our hero driving his car. Maybe that is one of the reasons he finds some solace in being a devout (relatively so) Catholic; when all is in flux, one seeks a handle to grasp. Ideally, that handle is not false. One of cinema’s greatest strengths, maybe its greatest, is its ability to move. Naturally, car chases, space ships, and explosions often get top billing. But one of cinema’s greatest, often unheralded capabilities, is its ability to dig into the human soul and explore the recesses of the heart. It accomplishes this because cinema can not only move, but consequently it unfolds in time. In this sense cinema is much like literature. But unlike literature, cinema reveals its narrative secrets immediately in a kind of focused reality. A camera pointed long enough at its subject will eventually reveal something true about that subject. Or, one could say, the subject will reveal itself because it cannot help but do so. Cinema also has the ability, in time, to display the rhythm of human nature, especially as individual shots slowly divulge their secrets. That is why Rohmer’s films can be so transfixing even though so little appears to be happening. Rohmer is a lover of people. Human nature, and especially the human heart, is Rohmer’s subject, and he find his subject infinitely fascinating. And isn’t it?! Some films claim a level of excitement for all their action, clear goals, and simplistic characters defeating their enemies. But there is no subject as fascinating as the human being. 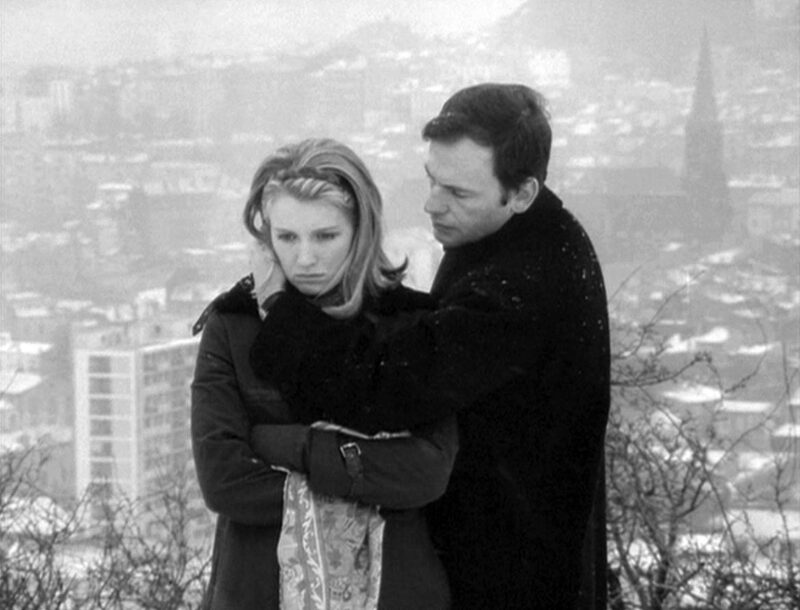 Finally, Jean-Louis, and the woman of his desire, Françoise (Marie-Christine Barrault), salvage their tenuous relationship in full view of the church spire by confessing their sins to each other. Because they take the plunge, as it where, and tell each other of their past infidelities, they are able to move forward, marry and start a family. I do not know if Rohmer is a Roman Catholic, but I do see him exploring rather deep issues of confession and reconciliation. To take a position towards the church that leaves questions open for the audience and does not denigrate received tradition, moral or otherwise, demonstrates Rohmer’s sophistication as a filmmaker. Today the black cathedral still towers over the residents of Clermont, alternately challenging and inspiring. >It still remains a very beautiful city and the cathedral is as beautiful and majestic as it was years ago. >ninja, thanks for stopping by and for your comments. Someday I hope to visit myself.